Cyprus announced Thursday that it would not allow vessels participating in the flotilla to Gaza to gather in its territorial waters, a move Israel called "an ethical deed and a voice of reason." However, the prohibition's only effect will likely be to delay the ships' arrival. Officials in Jerusalem say Israel held talks recently with Greece, Turkey, Ireland and other states in a bid to prevent the "Free Gaza" sail, expected to reach the Strip's shores Saturday. Free Gaza, But Not Shalit? 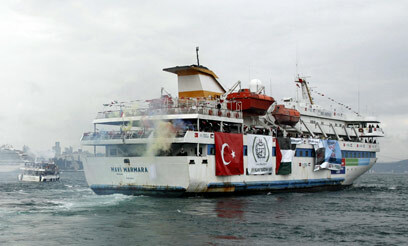 Israel claims the flotilla offers endorsement for terrorists. So far, however, Cyprus is the only state that has agreed to ban it. Defense Minister Ehud Barak told the foreign ministers of Greece, Ireland, and Cyprus Wednesday that the sail is "a political and press-related provocation, and not a humanitarian mission". He explained that there is no humanitarian crisis in the Strip and that thousands of tons of various products are brought in every day. However, organizers of the flotilla said Israel's offer to take the supplies into Gaza itself had been too late in coming. Greta Berlin, one of the Free Gaza leaders, said all nine boats had already departed before the offer came in. She added that 700 activists were on board. Berlin said the Israeli government "has a strange way" of treating the international protest. She said the organization wanted to "break the siege on a million and a half residents of Gaza", and that international law and the Geneva Initiative was on their side. Berlin added that the activists wanted to help Gazans build schools and universities, and to bring them food and medical supplies. The campaign for the release of kidnapped soldier Gilad Shalit announced Thursday that organizers of the sail had refused their offer to support the sail if Hamas would allow the activists to see their son and hand over a letter and package to him. Free Gaza's legal advisor said she had refused because the offer had come in after the ships had left. Audrey Bomse said she "had no problem" with most of what was written in the letter but that she could not give it to the activists, who were already at sea when she received it. She said she would try to get in touch with some politicians on the ships and ask them to assist in the matter. Dror Feiler, a former Israeli who currently resides in Sweden, said he and his colleagues had not yet decided what they would do upon meeting Israeli Navy ships, but that they had enough supplies to wait out a few weeks. Feiler added that the Israeli offer to transport the supplies to Gaza was insufficient, because the issue at hand is "the illegal blockade" and not just supplies. "The goal is to use the international law on our side to enter Gaza. If Israel wants to resist, like a pirate state, it can resist. If we are detained, more ships will come in a month or two," he said. "Just as the wall in Berlin fell, the blockade will fall. If Israel removes the blockade we will all be able to go home." See all talkbacks "Cyprus bans Free Gaza boats"